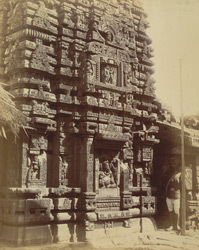 Photograph of the Shishireshvara Temple, Bhubaneshwar from the Archaeological Survey of India Collections, taken by William Henry Cornish in 1892. This temple dates from the late 8th Century and it is situated in the same compound of the Vaital Deul. The upper part of the tower that covers the sanctuary has disappeared. The walls are decorated with very fine sculptures including those of Ganesha and Nataraja. This view shows the Ganesha image in the niche in the centre of the façade. A uniformed Indian holding a measuring ruler stands at the right.